← Monday ~ Pick of the week! Have you ever wondered if a piece of jewelry you had, was real, or fake? I’m sure a lot of us have either received some gold jewelry as a gift, had some pieces passed down to us from relatives, or purchased gold jewelry from auctions, estate sales, and weren’t quite sure if the pieces were real. By American standards, fake gold is anything less than 10 Karats. If you’re wondering whether your gold is real, the most reliable way to find out is to take it to a certified jeweler and have it tested. If you want to check it for yourself, here’s a list of tips to tell if it’s real or fake. Gold is not magnetic, but many of the metals that are often used in fake gold or gold plating are. If your jewelry is attracted to the magnet, it’s not 100% pure gold. However, if it isn’t attracted to the magnet, it is still not necessarily real. All of these methods can be useful ways to see if your gold jewelry is made of real gold or fake. However, they will not give guaranteed answers or tell you the quality or carats of the piece. To be certain, bring your gold jewelry to a certified jeweler. This entry was posted in Jewelry, Jewelry Metals, Jewelry Tips and tagged difference in gold, Gold, gold jewelry, real vs. fake gold. Bookmark the permalink. ok i just bought a herringbone necklace and it says 14k on one side and korea on other is it real or fake? Hello Terry, I’m not really sure if it’s real or fake, without seeing it in person. The best way to find out is to take it to your local jeweler and they can tell you if it is. Please bring your necklace by one of our Satterfield’s Jewelry Warehouse stores and have our jewelry expert take a look at it. It is difficult to give you an answer on whether or not it is real, without seeing it in person. A circle with a number 7, could possibly mean jeweler’s or manufacturer’s mark. You could bring it by one of our stores and have our jeweler take a look at it for you to determine more information. Please bring your ring by one of our Satterfield’s Jewelry Warehouse stores and have our jewelry expert take a look at it. We cannot tell for certain without seeing it in person. Hi!! i just bought a “14k gold charm” and i’m a little confused because instead of only have 14k it said 14KN..what’s that mean? Hello Betty! 14K means there are 14/24ths gold in it and 10/24ths other metal. The N is an alloy designator, so a jeweler who needs to make it bigger can match the alloy. It’s like a dye lot code for gold. Different alloy mixes have slightly different colors. Hello I found a 14K gold ring how can I tell if it’s real or fake? Hello, you could bring it by one of our stores and our jeweler could let you know if it’s 14k. I have a gold chain. Its several years old but not tarnished or losing color. No markings n a magnet will pick it up. Does it sound fake? If a magnet is picking it up, then it’s probably plated. To make certain, you could bring it by one of our stores and have our jeweler check it for you. Probably a stupid question but does ALL real gold have markings? I have Necklaces That look real and are not magnetic but have no markings. Any suggestions will help. That’s a great question actually! Most people think that gold jewelry must be stamped in order to make it authentic, but sometimes this is not the case. In short, no, a stamp does not guarantee that a piece is really gold. In the US, however, there is a law that mandates that all gold jewelry sold by a vendor must be stamped marking the item’s karat number. The best guarantee that a piece is actually gold is to test it for purity or buy it from a reputable jeweler. For your necklaces, you could bring them by one of our stores and have our jeweler check it’s authenticity for you. Under the fake gold ring section it says that piece may have no markings at all and now here you say that most people think that gold jewelry must be stamped in order to make it authentic but sometimes that is not the case.So you need to clarify what no markings on jewelry really means. Hello Hellygio – The best way to determine that your piece is authentic gold, is to take it by your local trustworthy jeweler, to have them test it. There can be many reasons why gold jewelry might not be stamped… It could be an old antique piece that was never stamped, its stamp could have worn off, or it could be made outside the US. In short, no, a stamp is not a guarantee that a piece is really gold. If found a pendant but no marking I tried a bleach test but the color of the pendant didn’t changed.so is it gold or not? Hello Jessica, If you are in the Columbia, SC area, you can bring by your pendant to one of our stores and we can test it for you. i see a 18k mark in my watch..does it mean its real gold or gold plated? 18k contains a higher percentage (75%) of pure gold than 14k gold (58.3%) and is also softer. There’s a chance that your watch is real 18k gold, however if it was gold plated, it should have a GP stamped on it. A 750 stamp also indicates 18k gold. What brand is the watch? To make absolutely certain, you can bring it by one of our stores and have our in-store jeweler take a look at it. Hey I have a ring my dad bought me from Vietnam he told me it was 18 k but the only markings on it is HC 600 can you tell me if it’s real or not? The HC could possibly mean the maker’s mark and the 600 could mean around 15k gold. 14k is listed as 583 or 585 and 15k is listed as 625 in fineness. To make certain, you could always bring your ring by and have our jeweler take a look at it. I have a pair od gold hoop earrings…there is no stamp or markings of any kind. Also No a magnit does not pick them up. How can i tell if they are real gold? Hi Denise, You could bring your gold hoop earrings by one of our 3 stores and let our jeweler take a look at them for you. He can determine if they are real gold. Hi Cindy, You could bring by your bangle bracelet to one of our stores and our jeweler can take a look at it for you. I have a gold chain I bought a year ago it looked like it faded a little bit but not being picked up by a magnet…what should I do? You could bring your chain by one of our stores and our jeweler can take a look at it for you to determine if it’s real. Real gold is pretty heavy, so there’s a chance that your piece is real gold. Does it have any markings on the piece? You could bring by your piece of jewelry to one of our stores and our jeweler could examine it for you. Hi, do u guys have a store in Rochester NY? because i have a 14k gold that i want to make sure that is real gold, do i have to pay money for u guys to check it out? Hello, I’m sorry, we don’t have any stores in the New York area. We are located in Columbia, South Carolina. Hey I had this bracelet for 4 years now it hasn’t changed one bit its pretty heavy and has a marking on the back of this piece to attach the bracelet together the marking says 14kt .N.W. Is it fake? Hello Rose, It might possibly mean the initials of the jeweler that made the bracelet. 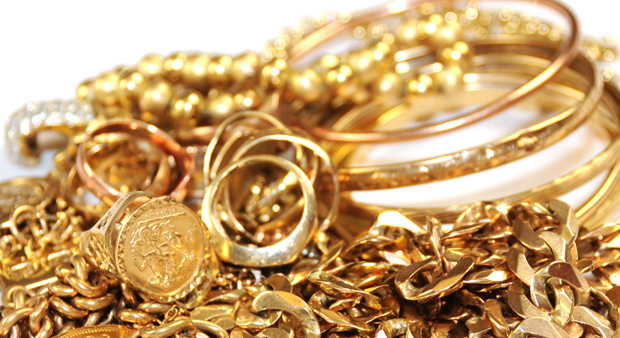 You could bring it by one of our stores and have our jeweler test it to see if it’s real gold. Hiya, I have a bangle that I can’t see any markings on other than 0.15?? There are stones in the bracelet could that relate to those rather than the ‘gold’? Thank you. Hello Lindsay, the 0.15 could refer to the ctw of the stones in the bangle. If it’s not marked it may mean that it’s under 10k gold. You could take it to your local jeweler and they could test it for you. Is it soldered? Typically, un-soldered chains from korea are plated gold. 585 stands for 14kt Gold, which is 58.5% gold. The Europeans use a slightly different method to reporting the percentage of gold on their jewelry. You could bring it by one of our stores to see if it is indeed 14kt. Hello, it means that it’s 18k which is .750 (75% Gold) – You could bring it by one of our stores to see if it is indeed 18k. Hello Jeanette, I think you are speaking of “non reputable” places you can buy jewelry. I know there have been many different “scams” to have jewelry look like gold out of non gold items- it is intended to fraud customers or more recently people buying gold from customers. It weighs SIGNIFICANTLY more than a gold piece does, so it can be very costly if bought as gold. I bought a pair of earrings label AS14K. Are they real? The stamp “AS” sounds like the maker’s mark on them, so they may possibly be real. You could bring them by one of our stores and have our jeweler take a look at them. I found a gold bracelet but it has no designs or numbers on it. Could it be gold still? It may possibly be a vintage piece, as older jewelry does not have any marks stamped on it. Is the piece attracted to a magnet? If you’ve done the magnet test and still aren’t sure if this piece is gold, you could bring it by one of our stores and have our jeweler take a look at it. Hello Natasha, We think that the WCO stamped on the ring is the maker’s mark. 14k gold is composed of 58.3% gold and 41.7% of other metals. We hope that helps! Hello Jennifer, I think you meant “Figaro” chain. It’s probably tan color because of the piece being gold plated. Sounds like the gold plating is coming off and you can see the metal underneath. You could bring it by one of our stores and let our jewelry expert take a look at it. Pls what does the marking RNEL mean on both ends of a necklace? Also the pendant. It may possibly mean the maker’s mark on the jewelry. The makers of jewelry sometimes put their “hallmark” on the jewelry that they make. Hi Erick, We are located in Columbia, South Carolina. Dominique – 925 means sterling silver, however you may want to take it to your local jewelry for them to test it. If you bring it by our store, we can help you. Unfortunately, I’m not sure what that means. You would need to take it to your local watch store to see if they can determine what that means. Hello I recently purchased a 10 k rose gold bracelet from the flea market for my mother’s birthday. It possess two stamps, one that reads “italy” and another that is “10k”. I do admit that I was I such a fluster in the finding and obtaining the piece as I was doing this on the day of her birthday, that I was less careful and rather impulsive. I tested it with a magnet at home and was a little relived to see no reaction of attraction in it. But based on small information I have just shared about the bracelet can you tell me if it seems authentic? The only way for us to determine if your bracelet is authentic gold, is for you to bring it by one of our stores to have it tested. What does just KT stamped on a hawaiian bracelet mean? There are no other markings. Do I need to send a picture? Gold is measured in caratage, or KT. Karat with a “k” or “kt” is a measure of the purity of a gold alloy. I have a very thick and heavy gold necklace with JH marking on both ends but no karat specified. I tested it with gold testing kit and the gold didn’t disappear using 10k acid but higher that that, it totally disappeared. I’ve using while taking a shower and its color never changed. Is this plated or real? Thanks! Hello Romeo, We have no way of knowing whether or not your jewelry is real gold, unless you bring it by our store to have it looked it. It’s hard to judge if jewelry is real gold online without looking at it. Stop by anytime to one of our two stores and our jewelry experts can help you. Hello Danielle, We have no way of knowing whether it’s real or not, unless you bring it by our shop to have the gold tested. Stop by anytime and our jeweler, Jeff, can check it out for you. My necklace is marked Korea, it was bought at la jewelry district in 1990s, is it real gold? Hello Cathy, We have no way of knowing whether it’s real or not, unless you bring it by our shop to have the gold tested. Stop by anytime and our jeweler, Jeff, can check it out for you. Hello Abraham, Gold itself is inert, and does not typically react with skin to cause discoloration. But there are certain conditions under which gold jewelry can affect the color of your skin. Other metals are often added to gold in order to harden it or change its hue, and these metals may be responsible for the discoloration.